UPDATE: Its 2018 and we’ve got a brand new calendar for you! Get your 2018 Sales and Marketing Calendar for E-commerce here. It’s a new year and that means a new e-commerce promotional calendar! 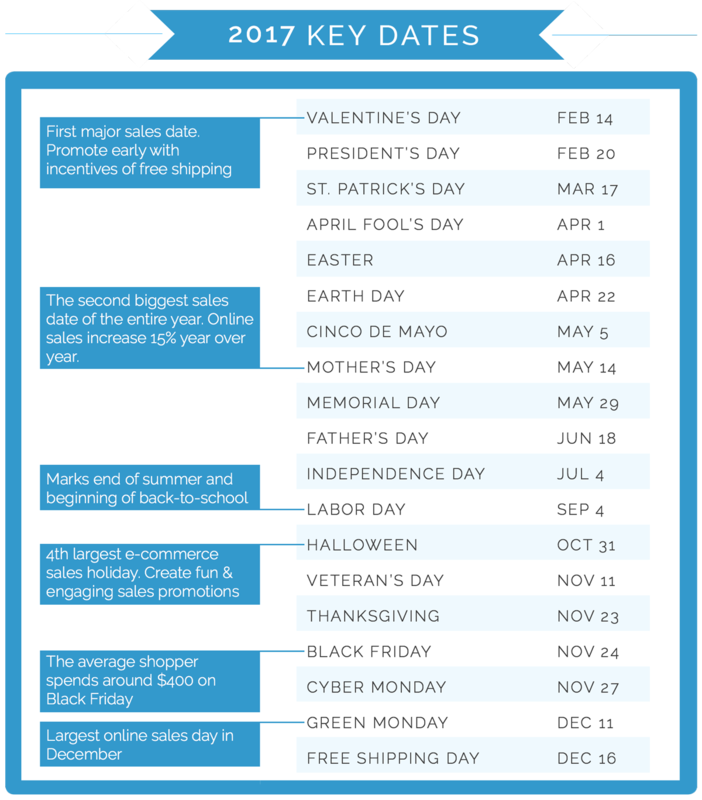 This calendar provides a quick summary of every key sales date and holiday that you should be aware of this year along with a few key statistics to help you with your seasonal promotions. Identify which holidays and sales dates align with your brand and your marketing schedule so you can be more effective with your seasonal marketing strategy and your e-commerce promotions. I’ve also provided a quick promotional checklist and some additional seasonal ideas for promotions. Determine what your goals are for this promotion – Do you want to drive sales, build your email list, notify visitors of sales or announcements? Once you get a clear picture of what you want to accomplish, you can move forward. Choose a type of promotion based on your goals – Now that you have your goals, select a type of promotion! Also, decide if you want to use promo codes, run an email pop-up, cart abandonment offer, messaging pop-up/bar, CTA pop-up, and so on. Design your promotion to fit the season or holiday – Promotion design can make a big impact on your brand perception and can increase e-commerce sales conversion. Take control of your shopping experience and have some fun with it! Choose which methods of driving traffic you’d like to use – Schedule email campaigns, consider PPC campaigns, and look for other ways to build anticipation. Target Incoming Visitors – Once your promotion is built, you’ll need to select which visitors will see your promotion. This can easily be accomplished with basic targeting rules on the Justuno platform. Choose between qualifications like a new visitor, geo-targeting, time spent on site, etc. In addition to key sales dates, it’s important to look at seasonal sales opportunities. This gives you an idea of what to focus on during each of the quarters of the year and provide an additional framework for seasonal promotions if you aren’t looking to run a different promotion for every single holiday. You’ve just finished up with the busiest and most lucrative time for e-commerce retailers. Time to relax, right? Not so fast. You’re most likely dealing with excess inventory and it’s in your best interest to clear that inventory to make room for this year’s stock. Use clearance sales, bundling, and other tactics to move old and slow moving products. For a full list of ideas for clearing out inventory, read 14 ways to turn excess inventory into cash. July is the slowest month for e-commerce with sales dipping by 30% compared to big sales months like December. August is also particularly slow early on until back to school sales start to kick in. If you’re selling items specifically for summer, it’s imperative that you prepare and execute your marketing strategy early. You want your summer shoppers completing purchases in April, May, and June before things start to slow down. One way to gain interest and promote summer products early on is running Spring Break promotions and releasing marketing materials in March. Luckily, you have several big sales holidays in that time frame that you can use to get people to your site. Here are some e-commerce sales strategies to help you during slow online sales months. Back to school shoppers start as early as April. Yes, 40% of B2S sales occur in August but over 50% of B2S sales occur before August. In the early summer months, it’s beneficial to craft a marketing strategy that specifically focuses on reaching B2S shoppers. This is an interesting sales season in that it spans so many products categories. The obvious school supplies, clothes, shoes, etc. but also dorm and home goods, organization, and electronics categories as well. This is a season that has parents shopping for children as young as four or five all the way up to eighteen-year-olds headed to college. Therefore, in order to help you efficiently use marketing resources and optimize your strategy, it’s worth taking a moment to think about who is doing the shopping and who it is for. Much of the focus during the holiday season goes to Black Friday and Cyber Monday weekend. This makes total sense. That weekend is the biggest opportunity to drive sales. However, the competition is fierce and putting all your eggs in one basket puts way too much reliance on a four-day span. Instead, start marketing to your shoppers early, stay consistent, and look for other sales opportunities. Green Monday is the biggest day of sales in December. Small Business Saturday (11/25) should be a big focus for smaller retailers. Free Shipping Day is perfect for driving last-minute holiday sales. Q4 is going to be your biggest sales period so get strategic and seek out less obvious sales opportunities in addition to Black Friday and Cyber Monday. This will not only decrease the competition you have for consumers attention but also less well-known holidays lend themselves to more entertaining marketing materials. Download the 2018 Marketing Calendar! While this blog post may be a year old, the downloadable calendar is up to date! Get all of the info you need to run effective seasonal promotions in 2018! Get The 2018 Marketing Calendar for E-commerce right here!